Since its foundation, the AHA Centre has actively monitored seven types of natural disasters that have occurred on a frequent basis across the Southeast Asian region. The natural disasters types that have registered on the AHA Centre’s radar include drought, earthquake, flood, wind, storm, volcano, and landslides. Throughout the previous six years, a total of 1380 disasters have been recorded by the AHA Centre’s team. While floods, winds, storms, and landslides top the list for frequency, slower-onset disasters, such as drought, still pose significant risk, primarily for ASEAN’s agricultural-based communities. The most recent recorded disasters have been the floods in Cambodia, Lao PDR, Myanmar, the Philippines, Thailand, and Viet Nam, that occurred due to the accumulated impact of the monsoon season and Tropical Storm 11 (Son-Tinh/ Henry). Between end of July and early August, the AHA Centre activated three emergency responses, responding to severe flooding in Southern Lao PDR and 4 states/regions of Myanmar, as well as powerful earthquakes in Lombok, Indonesia. The following chart may support further development of mitigation plans for disaster managers, as part of wider disaster-preparedness strategies. 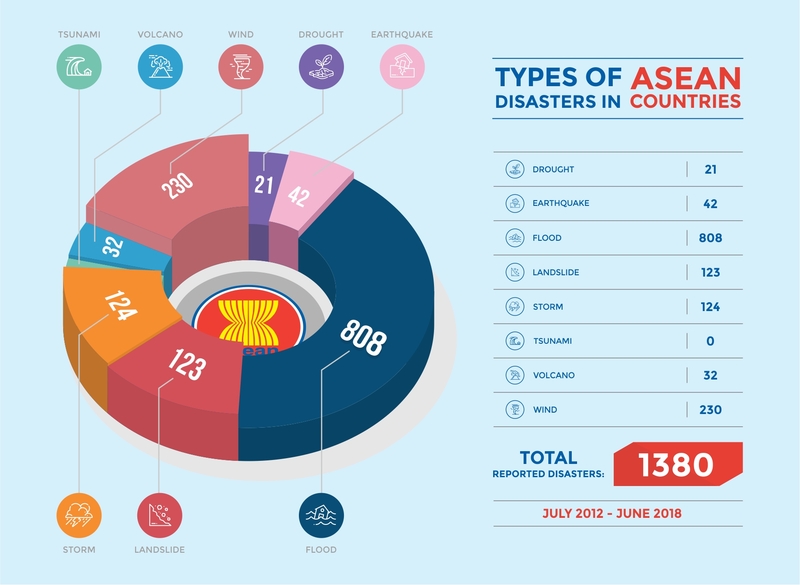 The presented information above is consolidated from the ASEAN Disaster Information Net (ADINet) and the Emergency Events Database (EM-DAT). Presented numbers may not reflect the actual risks due to lack of data availability in some ASEAN countries.